War Bears #1 review: Amazing art, generic characters, and a whole lot of potential – AiPT! Margret Atwood’s ‘War Bears’ has the potential to tell a great story. But does it? Margaret Atwood was already a powerful voice in literature even before Hulu released the critically acclaimed adaptation of her novel, The Handmaid’s Tale. The Canadian author has won numerous awards while also lending her name to many causes. Along with novels and poems, Atwood has also written graphic fiction. 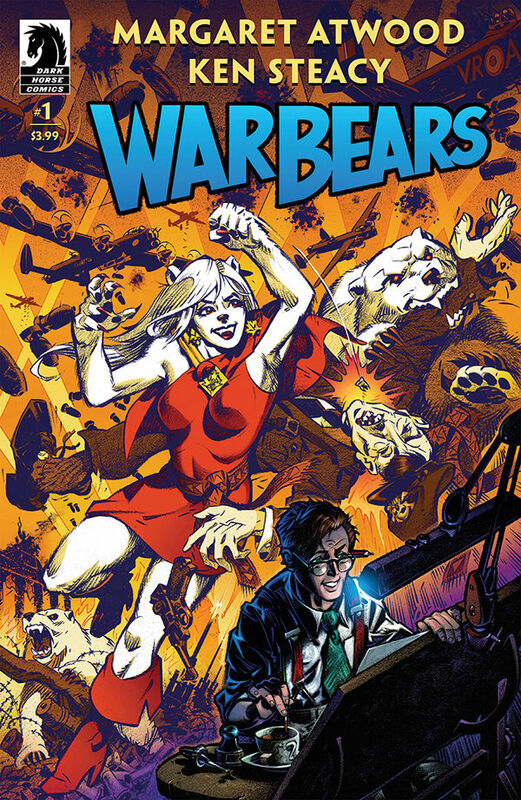 Her latest is War Bears, a release from Dark Horse Comics that chronicles how young Al Zurakowski longs to make a name for himself in the world of comic books. Ken Steacy’s art in the book is splendid. Every single character in War Bears is filled with life. From the opening scene, Al is instantly recognizable. The aspiring comic book artist is filled with a naive innocence. Steacy’s art immediately makes Al the likable underdog the reader cannot help but cheer for. Al is not a one dimensional character and Steacy does an excellent job of showing the character’s internal conflict. Whether caused by the nightmares that plague him or the problems at work he cannot seem to escape, Al shows a range of emotions that Steacy captures perfectly. This is a great example of the writer and artist working perfectly together. The main character is not the only one that is well drawn. Al deals with many people in his life and all of them are penciled with great detail. At home, Al’s father has a black and white version of manliness while Al’s mother is a little less rigid. At work, Al has to deal with his dominating boss Gloria, and his slick co-worker Mike. Gloria is especially well done as the head of Canoodle Comics. She has a take no prisoners attitude that can be seen by the stern expression that is constantly on her face. When Gloria’s expression does change, it is in a moment of clear surprise that does not last long. Much like Al, Steacy’s art tells the story of the character. The use of light and shadows in War Bears adds to the great artwork. The comic is set in Toronto during World War II and it takes on a color palette that is reminiscent of the era. At times it has a noir-like look that fits the tone of the story. There are also brightly colored panels that accentuate the action of the scenes. Despite its cliched characters, War Bears has a potentially deep story. The comic within the comic looks like something from the era and its impending popularity seems assured. Al is not just easy to root for, he has many barriers in his life that can make his story an interesting one. The reader has already seen he is prone to rash decisions; how will the war, possible success, and his brother affect the young man? There is plenty to work with, but will inconsistent writing make the whole endeavor worth the wait? War Bears is filled with eye catching art and the story is rife with potential. If only the characters were not so generic.